Hello again everyone! I've decided we need some more sympathy card inspiration around here! If you're anything like me, you probably hate making these. It's hard to know where to start. 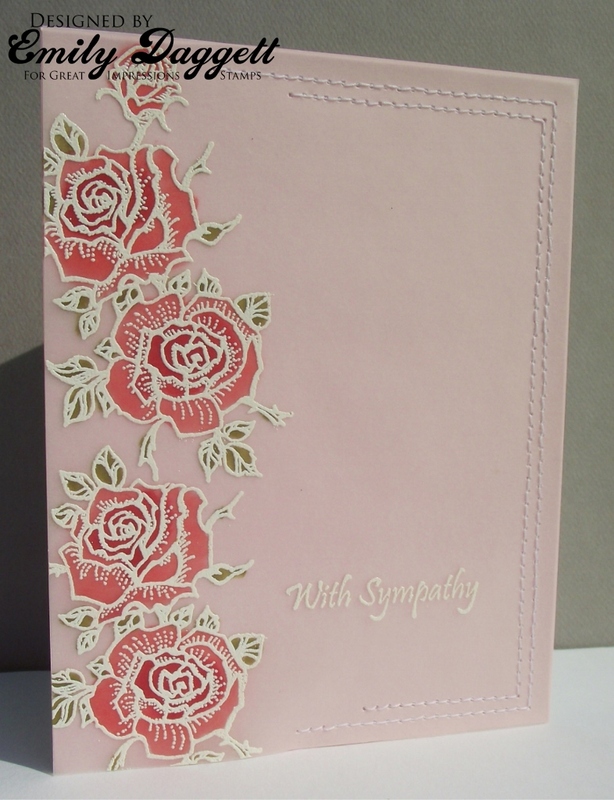 I've used Rose Trio G454, embossing them in white on vellum. I colored them from the back side of the vellum using Distress inks. The With Sympathy B178 sentiment was also embossed in white. I think that vellum can be tricky to work with because you have to either hide your adhesive under other elements, or use some other means of attaching it to the base of your card. In this case I sewed it down to the cardstock underneath along the top, bottom and right edge. Then I put just a little bit of glue under each flower. Quick and easy to put together and I think these would be pretty in so many different colors! Thanks for stopping by today! Beautiful Vellum Roses, love the stitching too!